A interesting quirk in the software of this site does not allow titles with apostrophes. This painting is titled "It's Chocolate's Fault" playing of the meaning of 'fault'. 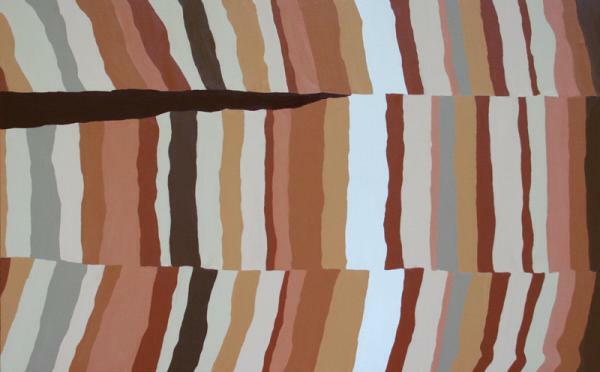 Because this site truncates titles at the apostrophe, this painting is presented as "Chocolate Fault". Not accurate but more accurate than "It" as happens when entered correctly. Layer upon layer of strata on strata...we all love to blame Chocolate when it really is our fault for being so in love and addicted to the sweet delicacy. Copyright Paul Anderson All Rights Reserved. [All work in this gallery is the original work of Paul Anderson. and is protected by US and International Copyright laws.] About Popi, Born in Democratic Republic of Congo (DRC), Paul Anderson spent most of his youth living overseas. He signs his work as �Popi.� His work is copyrighted and registered under his full name Paul Anderson.